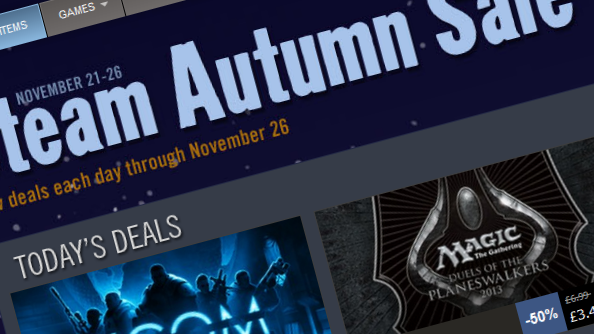 Like a seasonal shower, Steam’s Autumn Sale is suddenly upon us, drenching us in bargains. Some games are up to 75% cheaper than usual, but which of these is worth your money? Fortunately, you’re friends with the PCGamesN team, and that league of extraordinary gamers are just the fellows to turn to in times like this. So you sit down, you click through, you examine their comprehensive list of the day’s deals and and you absorb their collective wisdom. 1) DO NOT BUY A GAME AT THE START OF THE SALE UNLESS IT IS PART OF A DAILY DEAL. DO NOT DO NOT DO NOT. even further during Steam’s daily deals. All right, let’s have a look at what’s on offer. recommend it to anyone – even players that don’t enjoy strategy games. slaughtered. You will also probably have to sacrifice a country or two. All of the above is going to happen. But that’s OK.
on your own, so if you’re buying it, get it with a friend. I don’t have friends though. So there. television series, things happen! Terrible, terrible things. Tim: I am halfway through this and it’s bloody brilliant. Bloody as well. And if anyone spoils it I’ll be sad. I’ve still got to play episode four/five but man has this got me good. safe. That’s the Walking Dead. goth Zelda. I think that’s probably why I haven’t played it. I own both this and the original, but I have failed to play them yet . library I haven’t played yet. Don’t judge me. Jules: I’m playing through Darksiders one at the moment. It’s brill. From what I’ve heard Darksiders 2 improves on that in every way. Empires fans by breaking from the formula set in the first two games. a “home city” that persists between games and upgrades via experience. the homeland to help you win your current game. It was a daring change and one I rather like. This may not be the best of the Age games (Mythology, remember? ), but it remains an interesting RTS with some bold new ideas for the final game in a storied franchise. Tim: I’d like to point out that Rob is wrong and that Age of Empires 3 is bad. Sanctum is a nice little mix up of the classic tower defence formula. which you stretch sentient oil things to make structures like bridges. that I don’t want to spoil. you a clue at the start. Every level has it’s “Ohhhhhhhhhhhhhh” moments which I think releases more endorphins than I can handle. Paul: I am the person who does not own this. Audiosurf never managed to create that feeling. in the game, will directly influence the amount of merit I give it. But I am *that* bonkers. perfectly priced for poor men. Not played this one either, I’m afraid. wobbly and it has one of the most opaque introductions in PC gaming. cheaper than a bag of peanuts. Tim: My mate Rob Hale made this, and you should totally buy it. Also, it is a good twin stick shooter. place – in a genre where permadeath should really fit in. over too soon and has absolutely no replay value. deaths. To increase the fun, add alcohol.